My Edenpire Gen3 is making a buzzing noise. It is not all the time, but only after it has been on for a while. Jas anyone experienced this? I have the same annoying problem. It heats well but the noise is so annoying I have to turn it off. Any suggestions for a fix? Happy New Year! Stay warm (and quiet). Edenpure gen 3 USA model PRE1325 A5275. How to replace tip over sensor and what is part number for a new tip over sensor? The tip over sensor is made into the rear circuit board.You have to replace the whole part. I just bought a used circuit board for $45 from edenpurepartsstore.com Look under the Eden pure classic 5275 parts and you will see board #0060. It also says under the picture this will fix the not level message. Fixed mine and has worked great ever since. 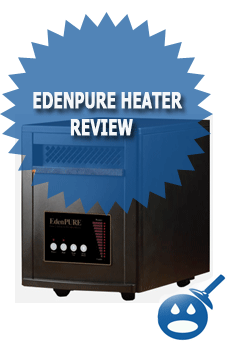 I have an EdenPure Quartz’s Infrared portable heater. When plugged in it just makes a beeping noise.power light comes on, but that is all it does. Temperature up or down will not turn on.. can you help me? Thank you. 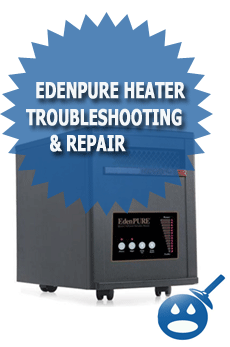 My edenpure heater will not come on, no light or noise. My edenpure gen 3 will not come on, there is a light but the heather will not come one. Exactly, it’s a heater, heaters are made to HEAT cold areas. Why the hell should an open window cause the heater not to work. That’s just awful design on Edenpure’s end. There is no logical reason as to why my heater isnt working while the window is cracked open. Dumb. I believe the Gen2 does not use quartz bulbs. It uses a ceramic heater. We purchased on so that we would not have to replace the bulbs every so many years. But we are having the same problem and figure it may be the thermostat or heat sensor. Still trying to get help with it. I have a gen 4 eden pure , when I turn it on it heats up then shuts off. Any ideas how to fix it. MY edenPure 1000 Comes on, Blows, Gets the bulbs glowing then after a while , the bulbs go out (cool down) then they (bulbs) never come back on? I have to shut the unit OFF for a while, turn it back on, then it heats for a while then Bloes cold air again till I shut it down and restart it? WTF? This REALLY BLOWS?? My Eden Pure(1000XL) does not turn on, the heat level lights come on but the bulbs don’t lite nor does the fan come on. Help! I have a model 1000 edenpure and when I plug it in and turn it on it will kick the breaker to the room that it is in. I just replaced all three heating tubes in my Gen4 Eden pure heater and it still blows cold air. When I was taking the unit apart originally a saw that a screw was left out of one of the retaining rings for the tubes and it had slipped down and had made a burn mark where it was touching the post of the tube. Could this have shorted out something in the circuitry of the heater? Is there a fuse in this system? How do check this out? I have 3 of these units and this one is the only one I have had any trouble with.I was a radar tech in the service so I know a little about electronics. If this repair is beyond my capabilities, where can I take this unit to be repaired?